A @steemhunt Tutorial on my Latest @steemhunt Review... How to Avoid Plagiarism and Get Approved Fast - The Awareness and Engagement Contest is On Now!! Use Presearch https://www.presearch.org to search for photos for your product or for your product to review. Use Plagiarisma http://plagiarisma.net/ to check your text so you don't have plagiarism in your review and get approved by the #steemhunt curation team faster. The "Awareness and Engagement Contest has Begun brought to you by Myself, @jeronimorubio in Collaboration with @bdcommunity... Good Luck Everyone!!! #STEEM to the MOON!!! that will Follow and Support You right back!! 1 - What feature would you like to see added to the @dtube platform? 1 - Answer the (3) questions in a Video Response. 2 - Upload your video to @dtube. 3 - Share your @dtube Video Link on #twitter. 4 - Share your #twitter link and @steemit/@dtube link on the contest page here. 5 - Upvote and comment on one other creator's entry post. 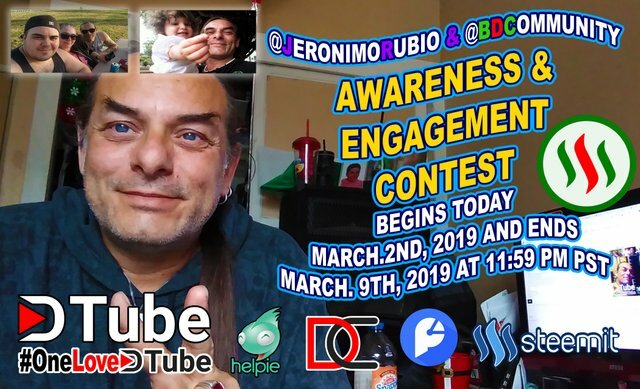 6 - Use the tags "jeronimorubio150 & bdcommunity"
The Contest Begins today March 2nd, 2019 and ends March 9th, 2019 at 11:59 pm pst. Winners will be Announced on Sunday, March 10th, 2019 and Prizes will be given out that day. 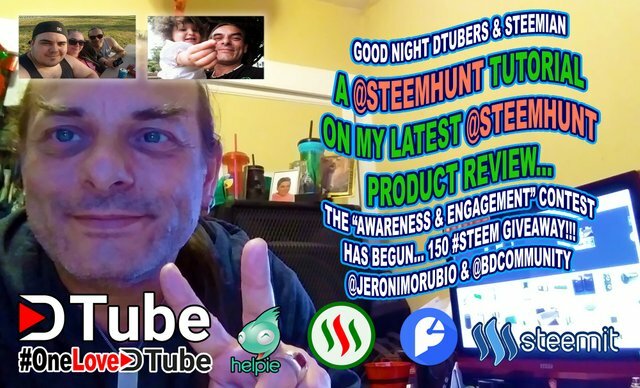 Much love and Respect to All of You Always, Your Brother for Life and Beyond, @jeronimorubio - @dtube, and #STEEM to the MOON!!! I do My Best to Always be Grateful to all of the Beautiful and Amazing People in My Life Like My Beautiful Fiance Vanja, Our Two Children Angeles and David and All of My Family in Mexico, Norway, Thailand (My Brother @stewsak), and here in the USA. They Are a True Blessing in My Life and I Love Them With All of My Heart. And I am also Always Grateful to all of the Beautiful and Amazing #steemains, #dtubers, @steemmonsters, @dtube, @onelovedtube, @helpie, @dcooperation, @steem-ua, @oracle-d, @steem.ninja, @steemhunt, @steepshot, @partiko, @vladivostok, @dtubedaily, @drisers, @bdcommunity, @nathanmars7, @steemnurse, #dtubefamily777, #linkseven77, @prettynicevideo, and all of the DApps and Dev Teams on these Amazing #steem Powered Platforms. I Love All of You as Well. Thats a long video, but here are some quick answers. 1.) To avoid plagiarism, you just have to study the app/product and understand it very well, and give a brief comment or ideas or any, just leave a comment, sh is not a writing community. Its pretty easy, dont be lazy to post. You get paid for posting products FYI. 2.) Fast approval? No there is no such thing as fast approval, if you want your post to get more votes or to get noticed, then post it earlier at exact time 12am KST. Dont post late. 3. )There is no such thing as curation team only Influencers who has bigger user scores to influence your hunt and make it to the top of the list. Also would be approved by the moderation team, your post should be fit from the posting guidelines. The feature that I would love dtube have would be Subtitles and a dark theme mode, I haveng checked dtube for awhile, I guess dark mode already existed? Ill try to upload a video to dtube, I miss uploading vids 10 months ago 😂😂 Cheers. Thanks for the insight on how @steemhunt works behind the scenes My friend @chuuuckie. I wasn't aware of all of this. Good to know. But as far as the writing goes of the description. I love to bring as many highlights about the product as possible. Thus, why I write the way I do. And the part about getting approved faster was just saying that if you produce content that isn't found to have plagiarism, you have a better chance of getting approved the first time instead of having to go back and perfom modifications. Would love to see you enter the contest brother... May You Always Be Happy and Blessed. Thank You for your awesome entry brother @hafizullah. Loved your video... Good Luck Brother... Keep inspiring us every Day... May You Always be Happy and Blessed. Iike the great initiative with bdcommunity. Yes I am quite interested to participate in this contest. And I wish you all the luck My Brother @hafizullah... I am so looking forward to your entry... I know it will be an excellent one for sure... #STEEM on Brother... May You Always be Happy and Blessed. You just got a 0.92% upvote from SteemPlus!